Brown-Forman (BF.B) was founded in 1870 in Louisville, Kentucky. The company was started by George Garvin Brown, a pharmaceutical salesman, and his accountant friend George Forman, with $5,500 in savings and debt. Brown-Forman has since grown to become one of the world’s dominant spirits and liquor producers, marketing numerous premium alcohol products in over 165 countries. In fact, it is the largest U.S.-based spirits company with a global presence. The Jack Daniel's family of whiskeys is the company's most valuable asset (60% of sales) and has been growing around 10% per year. However, smaller and new brands such as el Jimador tequila, Finlandia Vodka, Harruda tequila, and Woodford Reserve sport even faster growth rates and are the key drivers for the company. Brown-Forman’s largest and most important market continues to the the U.S., which represented just under half of total sales in fiscal 2017. However, the company’s overseas presence, especially in fast-growing markets such as Mexico and Russia, represents its best future growth opportunities. Brown-Forman distributes its products differently in each country depending on the laws of that nation. In the U.S., direct distribution to consumers is usually prohibited, forcing the company to use a large network of alcohol distributors (stores, bars, and airports). In other countries, Brown-Forman owns distribution companies where direct sales are allowed, and it also sells directly to alcohol distributors, wholesalers, and government-owned entities (liquor store chains). With 34 consecutive years of dividend growth under its belt, Brown-Forman is a dividend aristocrat. Brown-Forman possesses several major competitive advantages that have fueled its long-term success. First, the production of spirits like whiskey and bourbon takes specialized skill and time. Unlike craft beer, which can be produced quickly and pretty much on-demand, bourbon requires at least two years of aging in specialty barrels that take up a lot of space and involve various inputs that allow companies to create unique tastes. In other words, the upfront investment for a new distiller is high and risky, resulting in relatively few new competitors cropping up. For whiskey this is even more true with the aging process sometimes requiring up to 30 years, creating a fairly high barrier to entry. Simply put, high-end spirits are not a commodity product that upstart rivals such as America’s 1,600 or so craft distilleries can easily win market share in. In fact, those 1,600 small-time operators have a total market share of less than 5%, compared to Jack Daniel's 30% share in domestic bourbon and Tennessee Whiskey. Another important factor is the name brand, which is highly important to industry consumers who have historically proven to be less price sensitive and very brand loyal. This is why Brown-Forman spends so much on advertising ($380 million in the past year, or 13% of revenue). With an operating history dating back over 100 years and billions of advertising dollars cumulatively spent, Brown-Forman has created a loyal following of consumers who have developed a preference for the taste of its whiskeys. As a result, the company can consistently raise prices and maintain excellent profit margins. Brown-Forman is also able to take advantage of the highly fragmented nature of the spirits market. Since the top 10 global distillers only command around 20% market share, Brown-Forman has nice growth potential as it continues carefully building out its large portfolio of premium beverage brands and takes more share in international markets (Jack Daniel's share of non-U.S. whiskey is just 3%). The wind is at the company's back, too. Bourbon has seen a major increase in popularity (up 150% in the past decade) thanks to consumers switching away from wine and beer. This is a major benefit since historically spirit drinkers have proven more brand loyal than beer and wine drinkers. Whiskey has seen steady growth as well, fueling strong growth in the company's Jack Daniel's family of brands (about 60% of sales). That growth has been driven by periodic launches of new product lines like Tennessee Fire and Tennessee Honey whiskey varieties. Thanks to these product launches over the last five years, the company's sales have been growing about 50% faster than the industry's as a whole. 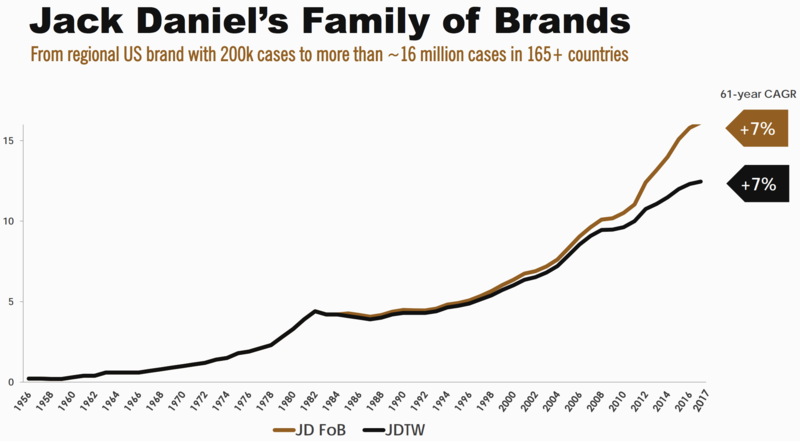 Looking even further back, you can see that the Jack Daniel's family of brands has delivered consistent volume growth for more than 60 years. Another major advantage is Brown-Forman’s massive, global distribution network, which includes various wholesalers, bars, grocery stores, and duty-free shops. Replicating this network, which reaches more than 165 countries worldwide, would likely take competitors decades of time and cost millions of dollars of expenses. When Brown-Forman launches a new product, it can plug it into its distribution system to get it on the shelves quickly. The company has been very successful in expanding its namesake Jack Daniel’s family of products to increase its reach to different price points. For example, in 1985 there were just two Jack Daniel’s brands, and today there are eight. Without its major distribution network, this level of success would have been much harder to achieve. Thanks to the iconic nature of Brown-Forman’s brands, the company enjoys premium shelf space as well as strong pricing power, which allows it to generate strong margins and returns on shareholder capital that have proven to be highly stable over time. Brown-Forman also benefits from its experienced management team led by CEO Paul Varga (over 30 years with the company). Management and the Brown family (who still owns controlling share in the company) have a very long-term and disciplined approach to growth. Rather than make lots of big, expensive, and often debt-fueled acquisitions, Brown-Forman usually prefers to launch new product offerings or brands in-house and thus focus on organic growth. The acquisitions the company does make, such as Slane Castle Irish Whiskey and BenRiach single-malt scotch, are high-margin products. These deals are usually partially funded by the sale of worse performing and less profitable brands (Southern Comfort, Tuaca, and low-priced wines). And thanks to a large and experienced international sales force with knowledge of local consumer tastes, Brown-Forman has been able to achieve some of the fastest growth rates in the industry in most of its major markets. Combined with the company's relatively large economies of scale, as well as the high-margin nature of premium spirits, this has allowed Brown-Forman to outgrow most of its peers over the long term. Going forward, the company plans to continue expanding strongly overseas including in emerging markets. Over the past few years the company's rolling two-year sales growth (what it calls "stack") in emerging markets has seen accelerating growth thanks to new product introductions such as tequila, vodka, and its super-premium bourbon and namesake whiskey lines. Thanks to its expanding product lines and continued push into faster-growing emerging markets, the company believes that it can achieve 3% to 5% volume growth in its key brands over the next decade. With moderate price increases on top, Brown-Forman's revenue can likely grow at a mid to high single-digit pace going forward. Meanwhile, a continued shift to higher margin products, stronger economies of scale (cost efficiencies), and share buybacks (3.5% annually over the last five years) should drive around 10% to 12% growth in EPS. Therefore, Brown-Forman could continue growing its dividend at close to 8% to 10% per year, in line with its historical long-term average. All while maintaining a safe payout ratio of 50% or less and an A- rated balance sheet by Standard & Poor's. At the end of the day, Brown-Forman could be an attractive long-term income growth investment for those looking to profit from the rise of emerging markets, where more affluent and larger middle classes are likely to fuel strong demand for the company's products. Overall, Brown-Forman has the strongest American whiskey brand in the world and has done an excellent job building its brand equity and converting it into growth for many decades. With a continued focus on advertising, new product introductions, and deeper penetration in international countries, Brown-Forman has plenty of opportunity to continue taking share in the fragmented spirits market and deliver on its growth targets. There are several risks to consider with Brown-Forman. First, consumer tastes can unexpectedly evolve over time, which can help or hurt demand for Brown-Forman’s products. Consumer trends are simply unpredictable. According to Brown-Forman’s 2015 annual report, American whiskey was a declining category from 1970 to 2010 as consumer tastes moved toward white spirits, for example. And since many of those products can take anywhere from 2 to 30 years (for some whiskeys) to age, management must be careful to balance supply and demand growth over very long periods of time. Brown-Forman needs to make highly accurate predictions about how much product to get into production now for sale many years down the line. If the company under-estimates demand, than it potentially faces market share losses to rivals like Diageo (DEO) or Bacardi. If it over-estimates demand, than it ends up with excess inventory which, while non-perishable, is also bulky, expensive to store, and will lower its margins. Where demand trends go from here is anyone’s best guess, but Brown-Forman’s business is concentrated in a single product category and doesn't have much production flexibility, which creates risk if consumer tastes unexpectedly evolve. Additionally, keep in mind that, while generally considered a defensive, recession-resistant industry, the spirits industry is generally a slow growing one. In fact, between 2004 and 2009 the industry’s 3.6% annual growth rate was considered a boom time, especially compared to the 0.6% annual growth rate expected from 2014 through 2020. This explains why we’ve recently seen so many large-scale acquisitions in the industry in recent years, including many that appear to be overvalued, such as Pernod buying Vin & Sprit, the makers of Absolut Vodka, for $8.9 billion in 2008, or 2014’s purchase by Suntory of Jim Beam and Maker’s Mark for $13.6 billion. While there may not be many mega-mergers left in the spirits industry (few companies are big enough to buy fellow blue chips outright), we’re now seeing a rash of merger mania in the smaller craft distilleries space, which is where Brown-Forman has traditionally looked for its acquisition growth. The problem with acquiring small craft distillers is that growth-starved industry giants are often willing to pay absurd valuations for what they hope to be the next mega-brand in the making. However, according to a leading industry study, 80% of America’s craft distillers are estimated to have annual sales of $1 million or less. In other words, it can become very easy to overpay for a growth runway that ultimately ends up being far shorter than the acquirer hopes. For example, in June 2017 Diageo agreed to purchase Casamigos, a super premium Tequila brand co-founded by George Clooney, for up to $1 billion, paying what some analysts believe is 20 times sales and $5,882 per annual case, a mind-boggling sum in an industry where four to six times annual sales or $1,000 per annual case is the norm for acquisitions. To put it another way, shareholders have to trust management to avoid overpaying for craft brands in the name of growth. Another risk is political and regulatory in nature. Remember that Brown-Forman operates in over 165 countries and thousands of smaller state, county, and local jurisdictions, many of which use excise (sin taxes) to raise revenue (and theoretically also to reduce problem drinking). In 2017, 22% of the company's sales were consumed by excise taxes. Brown-Forman has adapted to a world of high alcohol taxes, but there is always the risk that in the future, cash-strapped local and state governments, perhaps desperate to make up their public pension shortfalls, start hiking all manner of taxes. While Brown-Foreman's strong brand will somewhat insulate it from this (it can raise prices to compensate), ultimately higher taxes could still slow its rate of growth, especially in emerging markets where per capita income is still far below that of developed economies. Then, of course, there’s the fact that because so much of Brown-Forman’s business is overseas, its sales, earnings, and cash flow growth face currency risk over time. Specifically, a strong U.S. dollar could generate growth headwinds in an already highly mature (i.e. slow growing) industry. Finally, be aware that investing in Brown-Forman means accepting the decisions of the ruling Brown family, which is made up of about 40 descendants that own close to 70% of the class A stock (which have all the voting rights). While the family has done a good job of allowing the board of directors and management to grow the company over time, you need to realize that the Brown family has stated that they will never allow the company to be acquired. In fact, in 2017 Constellation Brands made an unsolicited offer to acquire the company, for what would have been likely been at least $22 billion, or a likely 10% to 20% premium to the current market cap. The offer was rebuffed by Brown-Forman because the Brown family desires it remain independent. While that could be viewed as a positive (the company is a dividend aristocrat after all, so it would be a shame if it were acquired), shareholders need to realize that owning this stock means you have effectively no control over what management does. Brown-Forman's long pedigree and impressive track record of consistent and profitable growth make it a potentially attractive long-term investment at the right price. The company's large portfolio of well-established spirit brands gives it a wide moat, and its world-spanning distribution network provides a long potential growth runway, especially in fast-growing emerging markets. Meanwhile, the firm's strong balance sheet, disciplined management team, and low payout ratio indicate that Brown-Forman's safe dividend is likely to continue growing at a relatively fast pace for the foreseeable future.